Forget everything you know about feeding your baby! 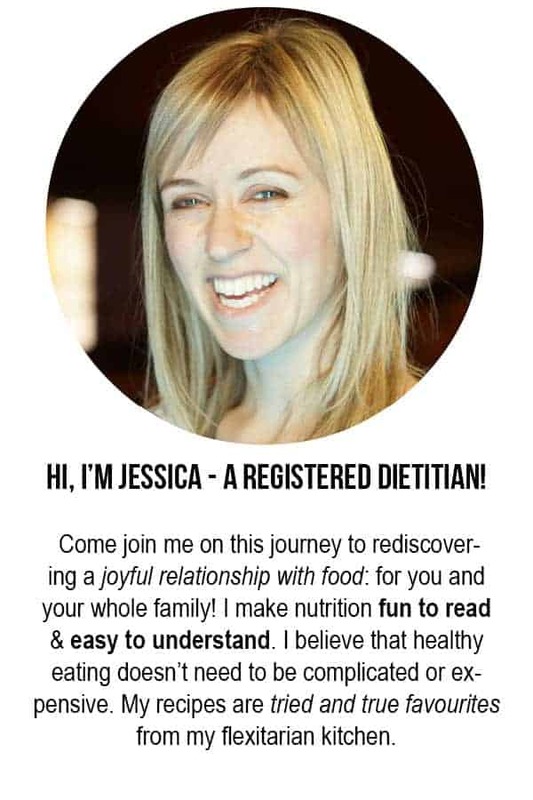 Ok, maybe not everything, but you need to know about this major shift in the approach to baby nutrition. Up until recently, it was advised to start your baby with infant cereal, followed by fruits and vegetables, then meats. Now, according to experts, meat, along with other high iron foods is the priority food for babies. It’s been bumped to the front of the line, and red meats are preferred! So when you start to introduce solids foods between 4-6 months, meat can be one of your baby’s first foods! Seriously? Red Meat for babies? You might be thinking, doesn’t that fly in the face of what we know about how unhealthy red meat can be for us? Well, the answer is yes and no (generalizations don’t work very well in nutrition). One reason red meat has a bad reputation is because of its high iron content. Too much iron increases the risk of colon cancer, diabetes, heart disease, and premature death. When we eat too much iron, it isn’t absorbed by the small intestine, and continues down to the colon where it feeds bad bacteria and acts as a pro-oxidant. When red meat causes health problems, it’s because people eat too much of it and get too much iron. 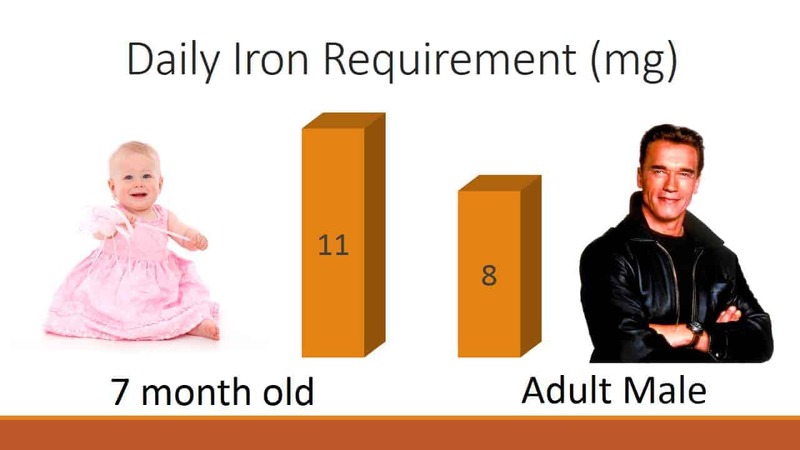 At about 6 months of age, though, babies start needing iron. A lot of it. They are born with full stores of iron which get topped up by breastmilk, but their bodies demand so much iron at 6 months that breastmilk can no longer keep up. By the time babies are 7 months old, they require more iron than an adult male. By the time babies are 7 months old, they require more iron than an adult male. This is why we introduce solid foods a month earlier, to provide all the extra iron they suddenly need. Since babies don’t eat large quantities of food, they need a food that is high in iron. Being so high in iron, red meat gives them a lot of bang for each bite. Adults, who just need maintenance doses of iron, would do best to avoid over-consuming iron-rich foods. Think about it this way: when the average North American man sits down for dinner, he’s probably eating about 6 ounces of meat. I don’t see many babies eating that much meat! By comparison, if this man feeds his child a baby-sized portion of red meat (1 oz), the man has now consumed 500% more iron than his baby did, when the baby needed more iron than him in the first place! Healthy is relative…. it all depends on what your body needs at a particular point in time. Since babies are at higher risk of food poisoning, meat should be fully cooked before being fed to babies. Don’t feed raw or undercooked meat to babies! If your baby is at least 6 months old, you can prepare meat in a way that will give them the opportunity to self-feed. Meat should be cooked soft (think slow cooked, tender meat or ground meat) and presented in the size and shape of an adult finger. That makes it easier for babies to hold before they develop the pincer grasp. If your baby is less than 6 months old or your decide to spoon food, you can make a puree out of meat. Check out this recipe for beef stew for baby! Salt should be avoided in food given to babies one year and younger. So hold off on the salt when preparing meat for babies and skip the deli and cured meats (like ham, sausage, bacon, sandwich meats) until they’re older. For everything you need to know about feeding babies, check out this FREE e-course here! So what do you think? 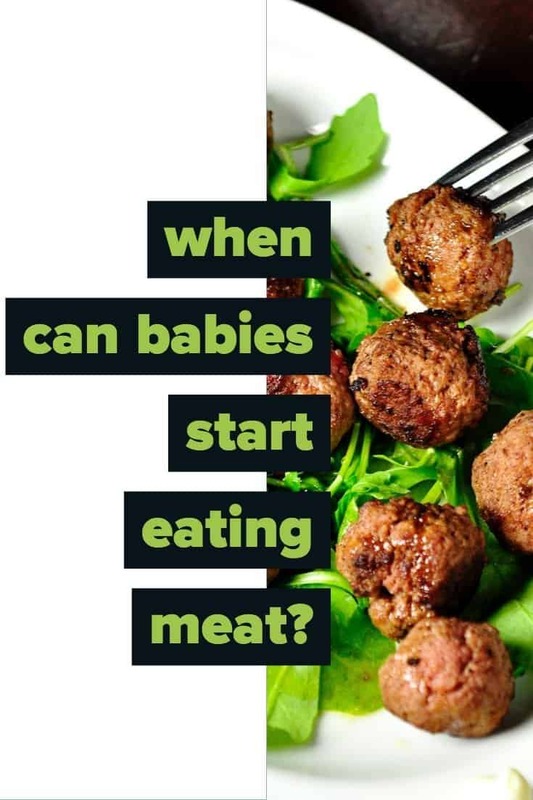 Will meat be the first food you offer your baby? 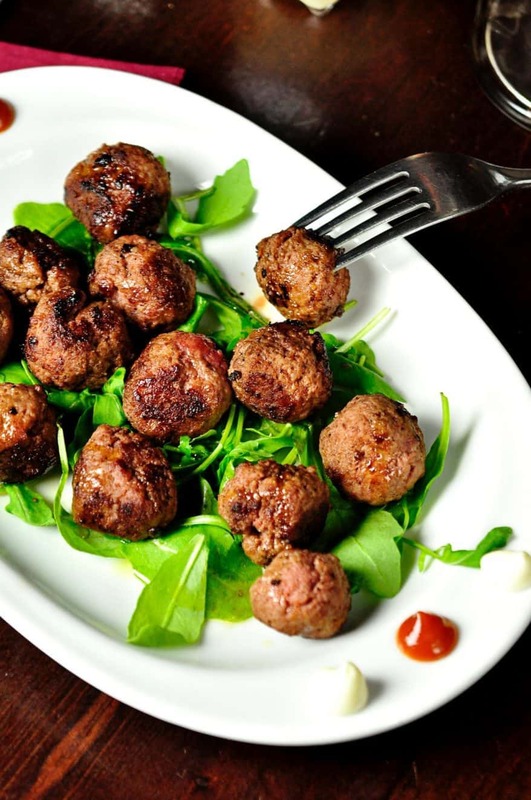 Could you do a post of a meat recipe please? Certainly! One meat recipe coming right up! I’ll do it as soon as I can. We leave on a trip to Germany next week so I’ll be busy packing and getting ready. But I’m sure I’ll have a lot of down time on the plane! La Leche League has been recommending meat as a first solid at around 6 months for over 30 years. The reason rice cereal is usually recommended is because it has iron added and is the is the “modern” way of getting way of getting iron into babies that came along with the other way of artificially feeding babies – formula. The best meats to feed young babies are plain and unseasoned. You can slow cook boneless beef or chicken, shred and freeze in individual portions.